I thought it was about time I got down to the nitty gritty; grasped the nettle, as they say, and discuss the details of the bike. I have been saving this post … like a piece of chocolate that you know you have in the fridge but you’re waiting for that special moment … ok, that could be just me, but you get the idea. 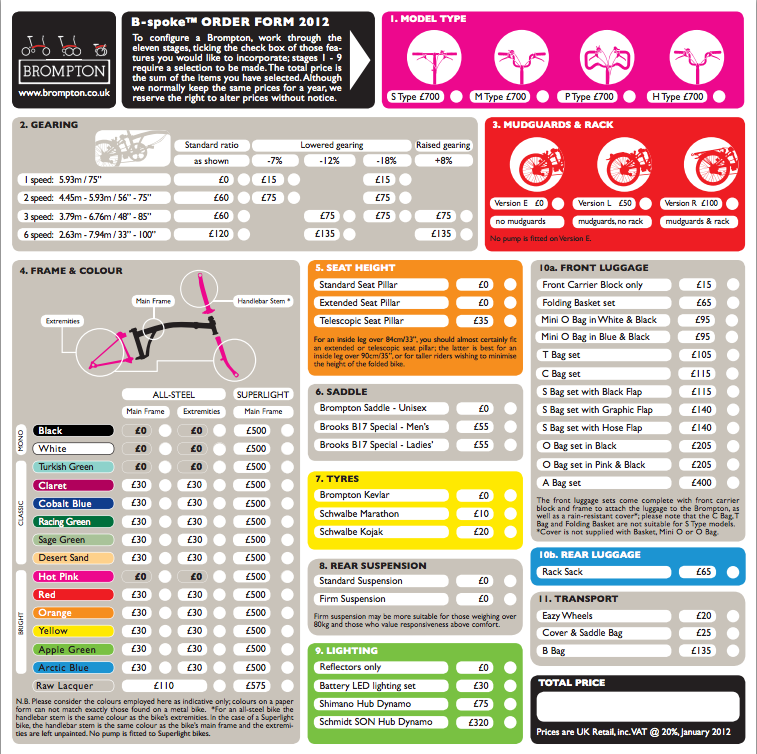 We have already decided on Bromptons but I thought it was time to wrestle with the actual specifications for the Brompton order. Of course, we could just buy a couple of Bromptons off the floor of some bike shop in the UK but we want ours to be bespoke. We are, after all, planning to spend a good deal of time on them in the course of the year. The way it works is that you compile your Brompton out of the range of options and then the good people at the Brompton factory create it especially for you. In the pursuit of research, I have had a bit of a test ride on a friend’s Brompton. This helped with some of the decision making but I think I might have to ask her if I can have another ‘go’ before we submit the final order. The other issue is that Brompton don’t take direct orders but only work with the Dealers, so we will have to adopt and befriend a Brompton dealer in the UK before we actually CAN submit the order form. The order form is a wondrous thing and full of promise for someone like me who wants what they want. Check out the order form here. Choices, choices! 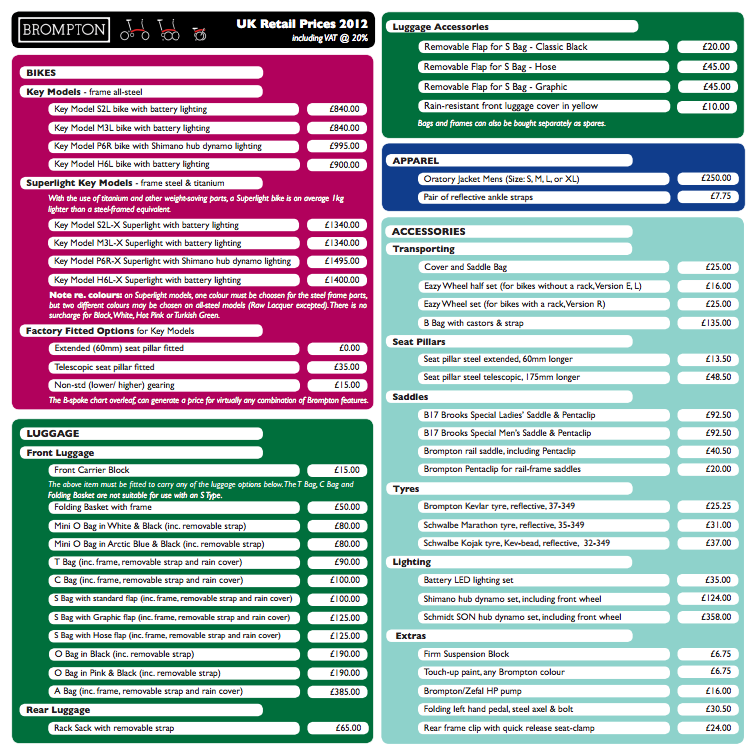 I have also found this great resource over at NYCE wheels where they have a step by step ‘Build your Brompton tool‘, which include videos to cover each choice option. Model type – I like a very upright bicycle so I am going to plump for the H-type handlebars, while the Husband is going for the M-type handlebars. Gears – I think 6 speed will be the one I go for as it seems to provide the best range but, to make it more complex, there are also higher and lower options once you have chosen how many gears you want. I always get quite confused with gears. I will need to talk to someone who understands these things and also knows what I currently have. That way I can figure out what it all means and what will suit me. Rear rack and mudguards – I will go for version R as I think that both of these will be essential. Mudguards are a no brainer in my book. Although we are toying with trailers rather than trying to get everything actually ON the bikes, I think the rear rack will be a good idea. Also these features will be good to have post Trip. Colour – I am completely torn between Turkish Green, Sage Green and Racing Green … and yellow … And then there is a part of me that says ‘black’, but I already have two black bikes and I would really just be avoiding the colour choice if I went with black. Then I look at the website and like all of the other colors as well AND you can mix it up and have two colours if you want! So I am sitting on the fence for now and waiting for some devine assistance with this one. The Husband is in a similar predicament so we will have to report back on this one. Seat height – Easy! As neither the Husband or I are ‘extensive’ in the leg department, the standard one will be fine. Saddle – that’s easy as well. I will of course be a Brooks. Tyres – I like the Schwalbe Marathon. I have had these type before (but in a different size) and found them very good and reliable. And not prone to too many punctures, which is important. The website says that these tyres are noticeably slower but offer increased durability so these are the ones for us? I can blame the tyres for going so slowly! Suspension – The husband is definitely going with ‘firm’ as he is of generous proportions, shall we say. I am toying with ‘firm’ myself as I am not a big fan of suspension and the bouncy sort of ride that seems to come with a lot of modern ‘comfort’ bikes. But I’m open to persuasion if anybody has any thoughts on this. Lights – I am a big fan of dynamo lights. I have them on the Triumph and absolutely love them. They are always on and never run out. Batteries, on the other hand, would really be too much hassle while touring and of course you also have the environmental impact of the batteries. The super duper SON dynamo lights are pretty pricy, so we will go for the Shimano lights. I have also just found out that Velo-ideale have LED replacement bulbs for older style dynamo lights so we could potentially get two of these and swap out the Halogen bulbs. I will have to find out if this is do-able. Luggage – When I look at the bags, obviously the touring bag (T bag) seems the option to go for as it has handy features in line with what we need and it is large, but I do find it a bit boring and ‘cycle toury’ … it would be nice if it came in a different colour. Transport – I think we will stick with the standard rolling wheels as I don’t anticipate rolling it all that much. So there you have it – the Brompton setup with a few decisions yet to be made. What are your thoughts?